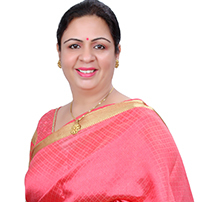 Dr. Gagandeep has converted her passion of teaching into a profession. She is a professor in the discipline of Commerce and Management. She loves to interact with the students, specially the youth. She feels that education is the most important weapon we can use to change the world. It creates greater opportunities to cultivate and encourage sustainable and viable economic growth. Gagandeep was exceptional and achiever from the very beginning. She gathered a large number of degrees and is a source of inspiration for many who yearn to study but having the fear of failure in mind, leave their education midway. She has done M.Com, M.Edu, MBA and PhD. in Commerce and Management. She did this from the prestigious Punjab University, Chandigarh. She has also cleared UGC NET exam in Commerce. Her present profile includes teaching the Human Resource subjects to the students doing graduation/ post- graduation in commerce and management. Her favourite subjects include HRM, Organizational Behaviour, Values and Ethics in Business, Communication skills, Guidance and Counselling amongst many others. She gathered huge knowledge and still finds herself to be a learner. She is very passionate about teaching and sharing her knowledge with the students. She has vast 18 years of experience in both academics and corporate. She specializes in Human Resource Management and an expert in Guidance and counselling. Gagandeep shares “Just like good food is necessary for a healthy body, education is equally important to attain get success in life. It helps a person to improve his/her status of mind, body and spirit and provides us the confidence and helps in personal growth as well. Her students now spread over the globe reciprocate with huge respect and love towards her. Seeing the current scenario, she believes that the need of the hour is Spirituality in Youth. Most of today’s youth is so much into depression, selfishness and insecurity due to huge competition and dearth of employment opportunities. They need to be shown the right path and they must imbibe the virtues of spirituality, i.e. love, care, compassion and empathy for fellow beings. Gagandeep is an intellectual and has an observant attitude. She shows open mind about things and explores new grounds. Being quite innovative, she believes in the philosophy of “Thinking beyond the box”. Having traits of a good researcher, she always has a thirst for new information and tries for possibilities to happen, even when everything appears to have been discovered or studied, or options exhausted. Having these characteristics, she has written over 30 research papers in the field of management and presented these in various national and international conferences. Much of her research work has been published in various journals and books. Gagandeep also believes in Women Empowerment. She feels that there are thousands of women who are successful in their respective fields. They must also be fighting not only the society but even their inner weaknesses. Keeping this in mind, she has successfully authored a beautiful book named Weaving Dreams into Reality. The book shares the journey of 20 successful and leading women of India who have achieved excellence in their respective fields – education, fashion designing, corporate, social work, medical, hospitality and entrepreneurship. She aspires to be the woman of substance who is able to bring out the potential from even the most naïve women and provide them a platform to share their talent with others. Working towards women empowerment, she explains that the true sense of empowerment is to empower our fellow beings.